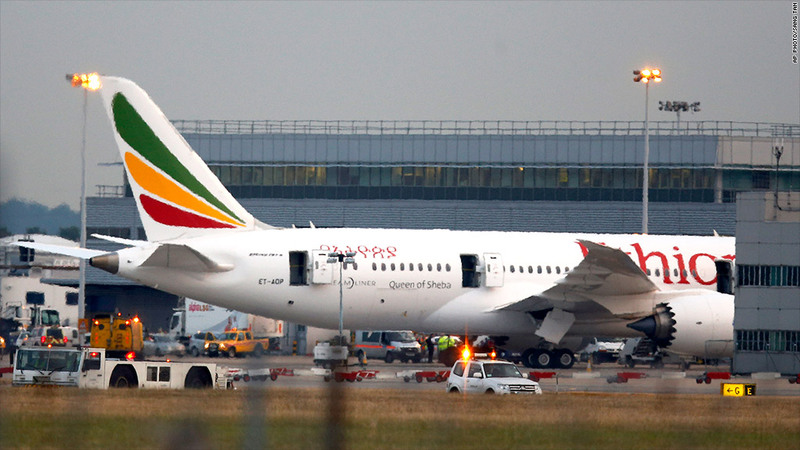 An empty Ethiopian Airlines' Dreamliner plane caught fire at London's Heathrow last week. Investigators are examining an emergency beacon made by Honeywell as they try to establish what caused a fire on an empty Boeing 787 Dreamliner at London's Heathrow airport last week. Friday's Ethiopian Airlines incident, and "a technical issue" on another 787 the same day, turned the spotlight back on the Dreamliner after Boeing's (BA) marquee aircraft was grounded earlier this year due to a fire risk with its batteries. The U.K.'s Air Accidents Investigation Branch was quick to play down the possibility that the Dreamliner's main batteries were to blame for Friday's fire, which caused extensive damage to the upper portion of the rear fuselage. In a statement Tuesday, the AAIB said the emergency locator transmitter -- which uses its own battery to send details of the plane's location in the event of a crash -- was one of several components being looked at in detail and Honeywell had been invited to join the investigation. "It would be premature to speculate on the causes of the incident at this stage," an AAIB spokesman added. Honeywell (HON) said it was far too soon to draw conclusions about the London incident, adding that it had no knowledge of any problem with its emergency transmitter, certified by the Federal Aviation Authority since 2005. The U.S. National Transportation Safety Board has sent investigators to London to help with the probe, which comes little more than two months since the Dreamliners started flying again after Boeing completed a retrofit to fix the problem with the lithium-ion batteries. Boeing's shares sank 3.6% on Friday but have gained about 40% since the start of the year. Customer demand for the Dreamliner has remained solid despite the grounding earlier this year. The plane's lightweight design -- using composite material rather than aluminum, and wires instead of some of the hydraulics -- allows it to be far more fuel-efficient than earlier models. Fuel is the biggest cost for most airlines. Boeing has delivered 68 of the planes to customers and has 862 unfilled orders. It says it plans to increase production to 10 per month by the end of the year, double the rate earlier this year. The first of the long-delayed Dreamliners went into service for Japan's All Nippon Airways in October 2011, and the planes flew without major problems for more than a year.